India’s much awaited brand attractiveness barometer, India’s Most Attractive Brands 2015 Report by TRA, a study measuring ‘attractiveness’ held in brands has been released. 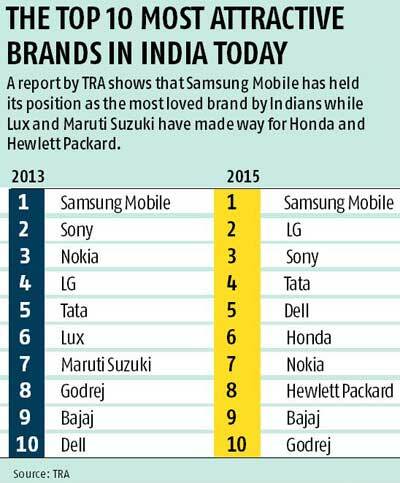 Samsung Mobiles has been ranked as India’s Most Attractive Brand in the study this year. The win reaffirms the brand’s hold over the Indian market as the electronics giant has also claimed the title of India’s Most Trusted Brand for 2015. LG came in at second position – overtaking Sony and Nokia – from 2013’s report. Rounding up the top three positions is Sony. The first Indian company on the listing is Tata Group ranking fourth. Dell occupies fifth position, narrowly overtaking Honda at sixth. Nokia comes in at seventh position; four rankings lower than its last appearance in MAB. Hewlett-Packard is in eighth position. Rounding up the Top 10 are Indian industry-stalwarts Bajaj and Godrej in ninth and tenth positions respectively. The report is launched annually by TRA (formerly Trust Research Advisory), a company of the Comniscient Group, a diversified communications group. India’s Most Attractive Brands 2015 Report, the second in its series, is the result of comprehensive primary research conducted on the proprietary 36 Traits of Attractiveness Matrix of TRA (formerly known as Trust Research Advisory). This year’s study involved 15,000 hours of fieldwork covering 2312 consumer-influencers across 16 cities in India and generated 5 million data-points and 17,000 unique brands from which the top 1000 brands have been listed in this year’s report. The 180 page, hardbound report is available for Rs. 14000/-. Among India’s 1000 Most Attractive brands 230 categories have been listed. The categories with the maximum brands were Food & Beverage represented by 160 brands, FMCG represented by 145 brands, Automobile represented by 58 brands and Apparel represented by 56 brands. Some of the important category leaders in Brand Attractiveness are LIC (BFSI), Fastrack (Branded Fashion), Bharat Petroleum (Energy), Dove (FMCG), Pepsi (F&B), Dabur (Healthcare), Google (Internet), Prestige (Kitchenware), Birla Cement (Manufacturing), Bata (Personal Accessories), Salman Khan (Personalities), KFC (Retail), Airtel (Telecom) and Indigo Airlines (Transportation).